Chesterfield suffered their sixth-straight league defeat as Jamal Fyfield scored his second goal in as many games for Boreham Wood. Pressure is slowly mounting on Martin Allen’s side despite a committed second half display, who haven’t picked up a league win since the beginning of August and sit just three points above the drop zone after Tuesday’s defeat. The hosts got off to the perfect start after just eight minutes when Spireites keeper Callum Burton failed to clear Keiran Murtagh’s cross from the left for the Wood, before the ball fell kindly to Fyfield whose first-time effort looped over the visitor’s keeper and into the net for second goal of the season. Allen’s men didn’t really threaten until the end of the first period when Jerome Binnom-Williams found himself in a decent amount of space to the left of the Boreham Wood penalty area, but the defender’s right-footed effort flew just over the crossbar, which drew to a close a disappointing first period for the visitors. The Spireites started the second half brightly and went close through Haydn Hollis’ close-range header that flew just wide of goal from Drew Talbot’s cross, before Marc-Antoine Fortune’s shot looked set to find the net but for Fyfield’s goal line clearance for Boreham Wood. Allen’s side were desperately trying to force the initiative and should have levelled on the hour when winger Zavon Hines’ free-kick smacked off the Boreham Wood post before eventually being cleared away from danger. Levi Amantchi’s flicked header on 70 minutes beat the Wood defence and saw Spireites striker Lee Shaw run through on goal, but he put his right-footed effort incises wide of goal. Despite a late rally in which Curtis Weston went close for the Spireites, Allen’s side couldn’t find a leveller. 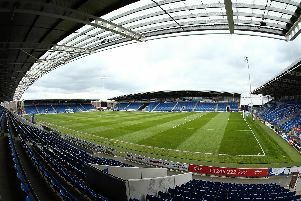 Chesterfield: Burton, Fortune (Amantchi, 69), Nelson, Shaw, Binnom-Williams (Reid, 69), Weir (Barry, 45), Maguire, Weston, Hollis, Talbot, Hines. Unused subs: Evans, Rowley.